The World Trade Press World Atlas, Pocket Edition is our travel version of our full-size World Atlas, Desk Edition. At 5″ x 7″, it is small enough to take on trips. With 54 two-page spread detailed maps in full color, a 160-country data section and comprehensive index, this World Atlas packs the information of a much larger format reference into a convenient, portable book. Our World Trade Press World Atlas, Pocket Edition is printed in full color on coated paper, with sewn signatures and hardcover binding. 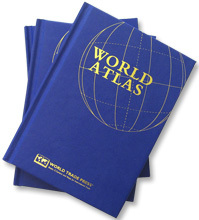 The World Atlas, Pocket Edition can be co-branded with your company logo and tag line (min. quantity: 100). Look for it under “Co-Branded Products” in the directory.